The park has been undergoing a $1 million renovation over the past several months. A grand re-opening celebration is scheduled Feb. 2. 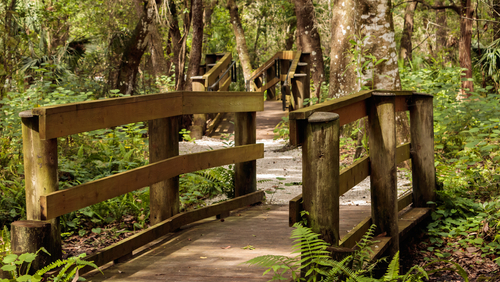 CLEARWATER – The city of Clearwater is ready to unveil a brighter and more beautiful Moccasin Lake Nature Park that is sure to captivate visitors. The 51-acre gem in the middle of Clearwater featuring trails and boardwalks surrounded by nature and wildlife, has been undergoing a $1 million renovation over the past several months. To celebrate, the city of Clearwater is hosting a grand re-opening celebration at the nature park on from 10 a.m. to 3 p.m. Feb. 2. There will be food trucks, organizational booths, vendors and more. Upgrades to the park include a newly renovated interpretive center, educational toys, a new playground, an amphitheater, butterfly garden, turtle pond, a trail system, birds of prey exhibit and more. The newly renovated nature park and classroom will be available for hosting team-building opportunities, private parties, weddings and community events. The park also will be home to some educational programming that is free to the public. Programs include presentations from famous birders and photographers to talks about how you can transform your own backyard to create a bird-friendly habitat or butterfly garden.